Nevada Cooler Pad is the market leader for evaporative cooling. We take pride in the fact that we have offered the best quality parts and accessories to our customers for over 65 years. We have had a long-standing partnership with Bestorq belts. They have been our supplier for Vtorq, wrapped construction evaporative cooling belts. 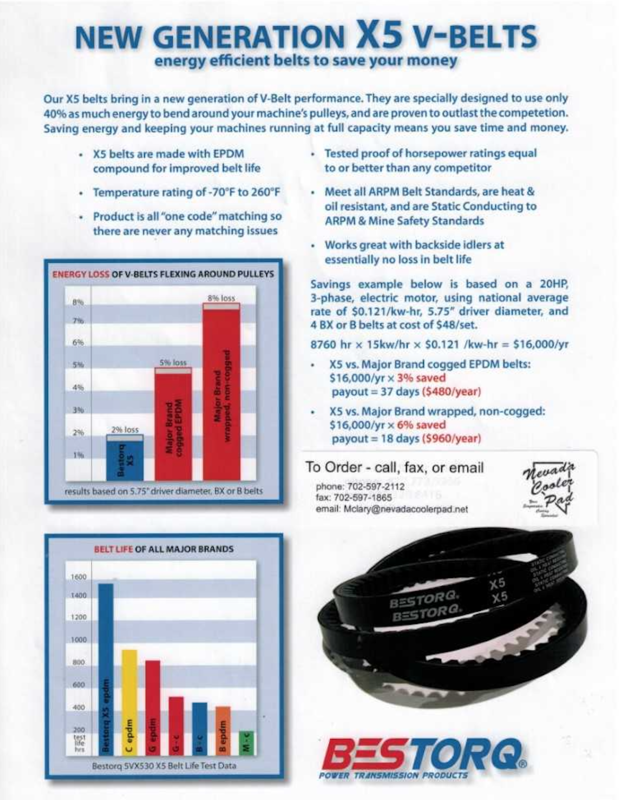 Nevada Cooler Pad has now expanded our product line to include the new technologically advanced X5 Series HVAC belts! Our mission is to provide a one-stop-shop. We did our research and listened to our customers. We are now stocking evaporative cooler and HVAC belts. Bestorq engineers have designed a belt that is made from unique chemicals that create a more durable belt that withstands our extreme temperatures. It is also more efficient than other brands. This new belt is technologically advanced at a value price. Nevada Cooler Pad provides free videos to show your staff how to achieve the best in energy efficiency using Bestorq belts. Please contact us today if you are interested in this new product or if you would like to set up a consultation for your company.